The club stayed at the very-well appointed Craignure Bunkhouse, arriving on various ferries over the couple of days leading to the weekend. The activities on the way up included Chris R2 running up Ben Cruachan in time to get the 3 pm ferry, although some folk were snared-up by roadworks at Crianlarich. On Saturday, there was a mass assault on the island’s only Munro, with 17 folk tackling Ben More by various routes in four parties. Fiona M and Susan the speediest to reach to Ben More via A’Chioch descending quickly down the tourist track, passing the party of six on their way up via this route. This comprised of Kate, Gillian, Harsh, Matt, Allan S and Sinead. A group of seven, comprising Duncan, Fiona C, Chris R1, Chris R2, Alexander, Marcus and Keith went over A’Chioch and Beinn Fhada on the way to Ben More. These two groups reached the summit at the same time, just as the cloud lifted from the top, giving cracking views across the islands to the west. Dave and Pauline went over A’Chioch on the way up. All the Ben More parties were off the hill by mid-afternoon and enjoyed the glorious weather with low level walks; all kept themselves busy. A few went climbing on a bolted basalt wall at Stac Liath, where Chris R1 attempted his inaugural rock climb. 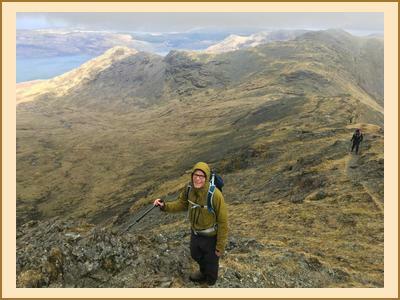 The remaining EMC members busied themselves with a variety of activities; Nigel added to his Marilyn collection by going up Coire Bheinn, Beinn na Sreine and Beinn na Croise with stunning views from the last. Anne and Alan walked over Creach Beinn and Ben Buie with stop for lunch at the car in between the hills. When they returned to Craignure, Alan went for a run over Sgurr Dreag and Dun da Gaoithe, reporting dark and foreboding skies to the west on his return. The dreich start to Sunday saw several folk making an early retreat from the island, chasing a more favourable forecast to the east. Some folk braved the weather and enjoyed low-level walks around the coast, looking for otters and visiting Duart Castle. 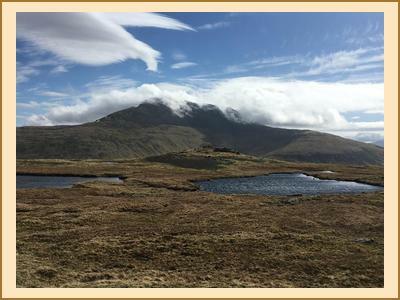 Inspired by Nigel, Chris R1, Kate, Gillian and Allan S opted to climb Carn Ban, a Marilyn near to the ferry, with high-hopes of seeing Mull’s famous white tailed eagles. Although the summit of the hill coincided with a particularly minging spell of weather, the walk was very enjoyable and lots of birds were seen. This included displaying short-eared owls and a fine white-tailed eagle showing itself during a spell of sunshine. The eagle obligingly sat in a tree as the party enjoyed the all-too-brief sunshine. The bird-spotting continued whilst homeward bound and queuing for the ferry, with hen harrier and great-northern divers seen. All-in-all a very enjoyable weekend!